Video of HC85 Products go through months of extensive testing before they reach your hands. All user functions are tested and all internal components are tested for quality. Rockville makes products that are virtually un-breakable! 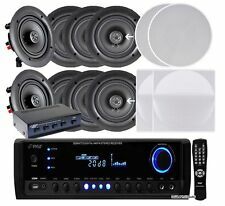 Pyle KTHSP390S 4 Pairs of 150W 5.25 In-Wall Speakers 300W Receiver/Selector. Speaker Selector Details Pyle KTHSP390S. Speakers Details 2-Way Stereo Sound Speakers. Receiver Details AM/FM radio with digital display screen.
' Features: ---Includes (2) 8.0’’ -inch Speakers ---In-Wall / In-Ceiling System ---Built-in Bluetooth for Wireless Music Streaming ---Quick Connect Spring-Loaded Speaker Terminals ---1/2’’ High Compliance Polymer Tweeter ---Polypropylene Cone with Rubber Edge ---Mounts Flush to Walls or Ceilings ---Cut-Out Size Template for Easy Installation ---Environmentally Friendly ABS Construction ---Perfect for Custom Installations & Applications Bluetooth Connectivity: ---Includes Bluetooth Wireless Audio Control Receiver ---Works with All of Today’s Latest Devices ---(Smartphone, Tablet, Laptop, Computer, etc.) ---Bluetooth Network Name: ‘Pyle’ ---Bluetooth Network Password: ‘0000’ (4 Zeroes) ---Bluetooth Version: 4. A low profile enclosure and wide coverage make the FAP42T a perfect choice for low ceilings. FAP42T combines superior coaxial speaker performance with wide dispersion and easy installation. SPEAKER TYPE Coaxial. NEW (2) 6.5" in-wall SPEAKERS.in-ceiling.PAIR.9" total frame size.Home Audio. These speakers are virtually invisible once they are installed. These speakers are enclosed so they project the sound great and are powerful at 120w. Poly-cone woofer with rubber surround. Mounting depth: 5 1/2". Video of HC655 Item Code: (5) HC655. Enjoy superb sound quality without bulky cabinet speakers crowding the room. These speakers are perfect for both large and small rooms. For larger rooms you can install 8 or more of them while in smaller rooms 2 or 4 will fill the room. 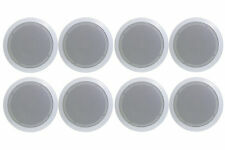 NEW IN BOX SPEAKERCRAFT AIM 5 THREE SERIES 2, 2-WAY 5 1/4" IN-CEILING SPEAKER. Trending at $80.50eBay determines this price through a machine learned model of the product's sale prices within the last 90 days. Monoprice Caliber In Ceiling Speakers. In either case, it's a win-win situation for those who desire high fidelity and those who put emphasis on decor. Dupont Kevlar Fiber Cone Driver. This lightweight transducer produces a natural sound with significantly less distortion than conventional drivers. WiFi Wireless Music Streaming Ability. Bluetooth Wireless Music Streaming. Built-in Bluetooth for Wireless Music Streaming. Bluetooth Connectivity WiFi Wireless Range: 98’ ft. Bluetooth Version: 4.0.
' Features: Includes (2) 3.0’’-inch Speakers Bluetooth Wireless Music Streaming Lightweight Aluminum Alloy Frame Housing Built-in LED Light: High-Efficiency, Low Power Consumption Full Range Stereo Sound Reproduction 2-Channel Digital Amplifier Spring-Loaded Clips for Easy Installation Reinforced Polypropylene Cone with Rubber Edge Simple Speaker Connector Post Mounts Flush on Walls or Ceilings Perfect for Custom Installations & Applications Environmentally Friendly ABS Construction Bluetooth Connectivity: Built-in Bluetooth Wireless Streaming Receiver Works with All of Today’s Latest Devices (Smartphone, Tablet, Laptop, Computer, etc. Input Power(Maximum / Nominal): 140W / 50W. -Paintable grille with magnets for quick and easy installation. Paintable Grill with Protective Cover Included: Yes. -Slim profile design for flush in-ceiling or in-wall mounting. Sensitivity: 88db 1W/1m. Maximum SPL: 107dB. Power Handling: 125 Watts. Impedance: 8 Ohm Nominal. Frequency Response: 40Hz-20kHz. Factory sealed, white grill included. 15 degree pivoting 7" glass fiber cone woofer. Video of HC85 Item Code: (4) HC85. Enjoy superb sound quality without bulky cabinet speakers crowding the room. These speakers are perfect for both large and small rooms. For larger rooms you can install 8 or more of them while in smaller rooms 2 or 4 will fill the room. It is in new condition. Never used. No original box included. Speaker only as photoed. No other accessories included. 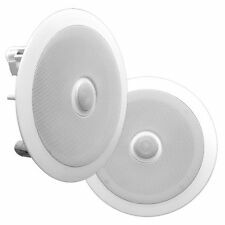 You are looking at one pair of used Sonance 623TR Round In-Ceiling speakers. They have been painted a golden color but can be repainted. They have been tested and sound great! I have three pairs if you’re interested. Please feel free to ask any questions and thanks for looking! This system features Bluetooth wireless music streaming ability. You will be able to wirelessly and instantly stream your audio through this four chan. Pyle KTPDICT8. Bluetooth Wireless Streaming Ability. 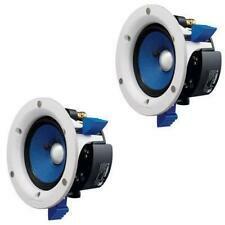 Monoprice Caliber In Ceiling Speakers 6.5 Inch Fiber 3-Way 2 (Pair) 4 Speakers. In either case, it's a win-win situation for those who desire high fidelity and those who put emphasis on decor. Light and rigid, well balanced, yellow woven Kevlar fiber cone woofers for distortion-free reproduction. Dog-legs make installation fast and easy. TDX's 6.5" In-Ceiling Speaker. Woofer Type: Kevlar Woven Cone. Woofer Size: 6.5". Tweeter Size: 0.75". Woofer Quantity: 1. Tweeter Quantity: 1. Tweeter Pivoting: Yes. Paintable aluminum grille. power handling: up to 40 watts RMS (160 watts peak). 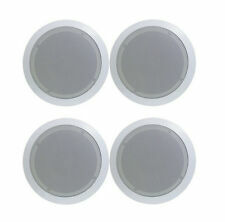 Pair of Sonance Round In-Ceiling Speakers BRAND NEW!!!!!!!!!! Sonance C Series. Output Level (SPL). Product Line. Speaker System Type. Amplification Type. Color Category. Just removed for picture purpose. Speaker Type.
' 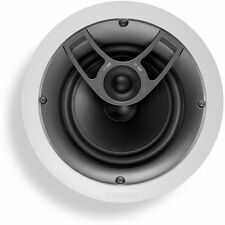 ---In-Wall / In-Ceiling System ---2-Way Stereo Sound Speakers ---8'' Midbass Speaker ---1.5'' High Temperature Voice Coil ---Directable 1'' Titanium Dome Tweeter ---4-8 Ohm Impedance ---300 Watts Rated Peak Power ---Frequency Response: 55Hz - 22kHz ---Mounts Flush on Walls or Ceilings ---Perfect for Custom Installations & Applications ---Includes Cut-Out Template for Easy Installation ---Cut-Out Dimensions: 9 3/8'' Diameter x 3 1/2'' Depth ---Overall Dimensions: 10 3/4'' Diameter x 3 1/2'' Depth ---Sold as: Pair ---Weight: 10.42 lbs. For stereo applications there is NO NEED even for a subwoofer, as these units can reproduce a surprisingly low bottom end - in our showroom we actually shake the floor below, without a subwoofer. The bottom end of these go to 70Hz.
' Features: Includes (4) 3.0’’-inch Speakers Bluetooth Wireless Music Streaming Lightweight Aluminum Alloy Frame Housing Built-in LED Light: High-Efficiency, Low Power Consumption Full Range Stereo Sound Reproduction 4-Channel Digital Amplifier Spring-Loaded Clips for Easy Installation Reinforced Polypropylene Cone with Rubber Edge Simple Speaker Connector Post Mounts Flush on Walls or Ceilings Perfect for Custom Installations & Applications Environmentally Friendly ABS Construction Bluetooth Connectivity: Built-in Bluetooth Wireless Streaming Receiver Works with All of Today’s Latest Devices (Smartphone, Tablet, Laptop, Computer, etc. 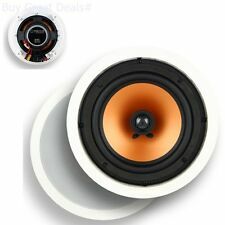 Pair Klipsch Synergy Home In-Ceiling Speaker KHC-6 white . Condition is New. Never used, got the receipt still. Bought new at Frys electronics 2017 for 76.99. UP FOR SALE IS A Yamaha NS-IC400 In-Ceiling Speaker (Pair, White). THESE ARE NEW. 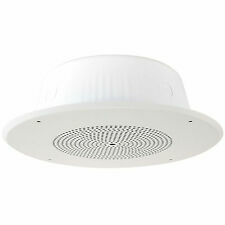 Polk RC80i In-Ceiling Speaker - White. Condition is Used. Shipped with USPS Priority Mail. Speakers in great condition only selling because I upgraded. Sound perfect small dents on grills, barely noticeable when installed. 24 Tile Bridges. 17 Speakers. This lot includes.